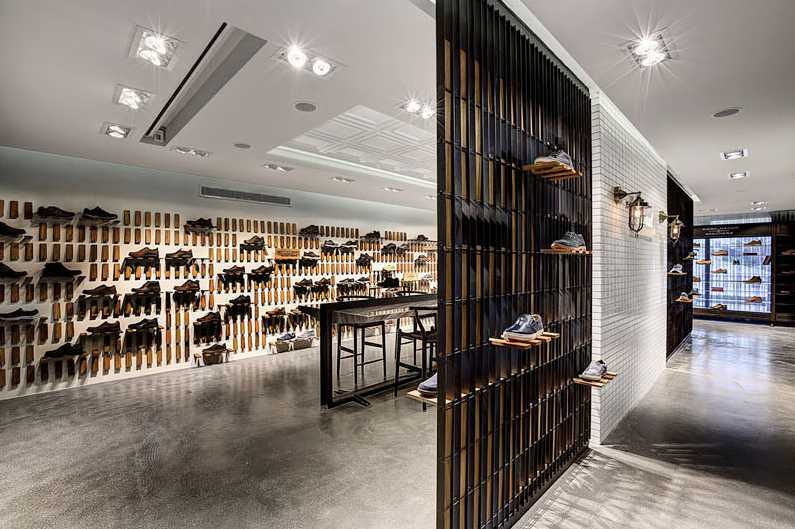 A recently opened Sketchers TR-Casual shoe shop in Istanbul was designed by Zemberek Design, an Istanbul based architectural practice. The design team includes Basak Emrence, Safak Emrence, Ece Ilgin Avci, Cansu Sezer and Pinar Sunbul. In lieu of regular shelving, Zemberek Design created an ingenious and practical system whereby individual pieces of wood are able to be flipped down to create a shelf. When flipped down, a see through effect is created and when not in use, the wood modules simply flip up into a vertical plane. Other areas of the store also incorporate the shelving design such as within the shop dividers. The flip-down shelving system allows for the look of the store to be readily altered at any time.